This Cappuccino Biscotti recipe opened my eyes to the possibility of flavors you can have in a biscotti. Before this recipe, I had only tasted almond biscotti, yet here I found a biscotti that combined the flavors of coffee, chocolate, and hazelnuts. And if that weren't enough, they are also scented with ground cinnamon and cloves. The Cappuccino Biscotti's dry, crisp and crunchy texture comes from baking the cookies twice. The first baking sets the dough, while the second baking dries it out. The biscotti's instantly recognizable long curved shape comes from forming the dough into a log and then cutting the log into slices after the first baking. 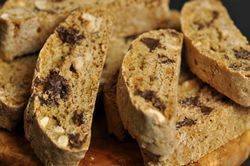 The rough and jagged slices of biscotti are then baked until most of their moisture is removed. Now, you can vary the length of the second baking. If you like a really hard and crunchy biscotti, perfect for dipping in your coffee, you can bake them even longer than the amount stated in the recipe. And if you prefer to just nibble on your biscotti, instead of first softening it in your coffee, you may want to slightly reduce the time of the second baking. These cookies do store for several weeks in an airtight container but they never seem to last that long in my home. Cappuccino Biscotti: Preheat your oven to 350 degrees F (180 degrees C) and place rack in center of oven. Place the hazelnuts on a baking sheet and bake for about 10 - 15 minutes or until their skins start to blister and peel. Remove from oven and wrap the hazelnuts in a clean dish towel and let them 'steam' for about five minutes. Then briskly rub the hazelnuts in the palms of your hands to remove their skins. Let cool and then coarsely chop. In the bowl of your electric mixer (or with a hand mixer) beat the flour, sugar, baking soda, baking powder, salt, and spices until combined. Stir in the chopped nuts and chocolate chips. Add the espresso mixture and beat until a dough forms. With floured hands divide the dough in half. On a lightly floured surface roll each half of dough into a log about 9 inches (23 cm) long and 2 1/2 inches (6 cm) wide. Transfer the logs to a parchment paper lined baking sheet, spacing about 4 inches (10 cm) apart. Bake for about 35 minutes or until firm to the touch (logs will spread during baking). Remove from oven and place on a wire rack to cool for about 10 minutes. Reduce the oven temperature to 300 degrees F (150 degrees C). On a cutting board cut the logs crosswise on the diagonal into 3/4 inch (2 cm) slices. Arrange the slices on the baking sheet, and bake for 5 - 8 minutes on each side, or until they are firm and pale golden. Remove from oven and place on a wire rack to cool. Store in an airtight container.